I first smelled Raspberry Mojito and tried a sample in store, and I was intrigued from the get-go. It smells strongly of raspberries and mint, and with a name like Raspberry Mojito there’s very little else you’d expect – but that really isn’t the same with the ingredients. Raspberry Mojito is made up of: apple, raisins, hibiscus blossoms, carrot, beetroot, peppermint, lime, raspberries, rose petals, natural and artificial flavouring. Not quite what I was expecting when I first smelled this tea. Apple? Raisins? This is supposed to be a berry flavoured drink! Nonetheless, despite (in spite?) of the ingredients, I bought a small sample bag because the iced sample I tried in store was enough to get me wanting a bit more. 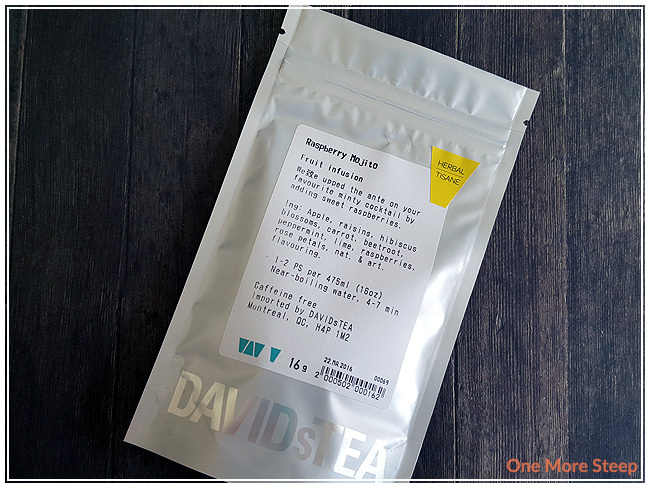 DavidsTea recommends steeping in “near-boiling water” for 4-7 minutes, as per the bag label. Their website classifies “near-boiling” as 90-95°C (194-203°F). I really do wish they kept with putting temperatures on their bags, rather than vague descriptions in hopes their tea drinkers know what to do. 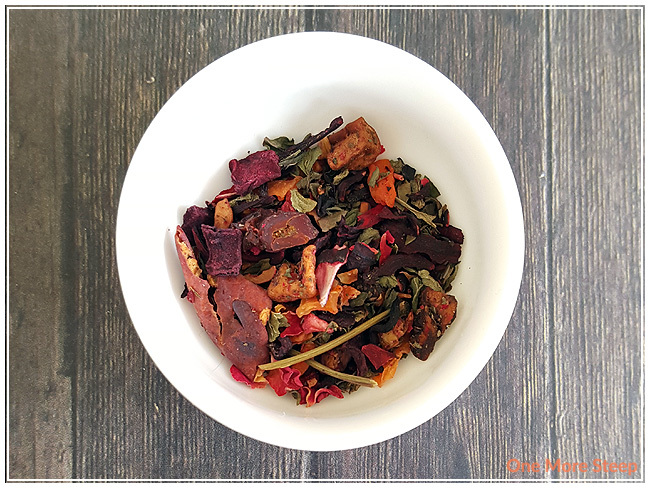 Then again, this is an herbal infusion – no bitterness from oversteeped tea leaves because there are no tea leaves. Raspberry Mojito steeps to a beautiful deep pink – most likely due to the hisbicus blossom, beetroot, and perhaps the rose petals. It has a very bright aroma of raspberries, with just the hint of mint. 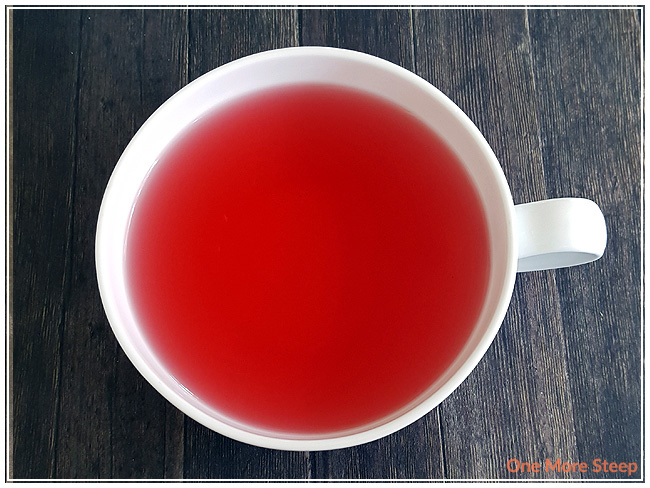 When tasting this tea hot, the raspberry is very much a front-and-centre ingredient that just kind of wows the taste buds. The mint comes in at the end of the sip, like an after taste with a fresh aspect. It’s quite enjoyable. I wound up icing the remainder of my pot of Raspberry Mojito, to have it iced. It makes for a fantastic iced tea, in my opinion. As Raspberry Mojito is an herbal infusion, I did not steep it a second time as I find those are always disappointing. I loved Raspberry Mojito. I find it a very refreshing drink (especially iced), as it does live up to the promise of its name with the bright raspberry taste and the minty notes to each sip. I would recommend this iced over hot, and perhaps even the addition of fresh citrus or berries to a pitcher if you’re making a big batch of it.